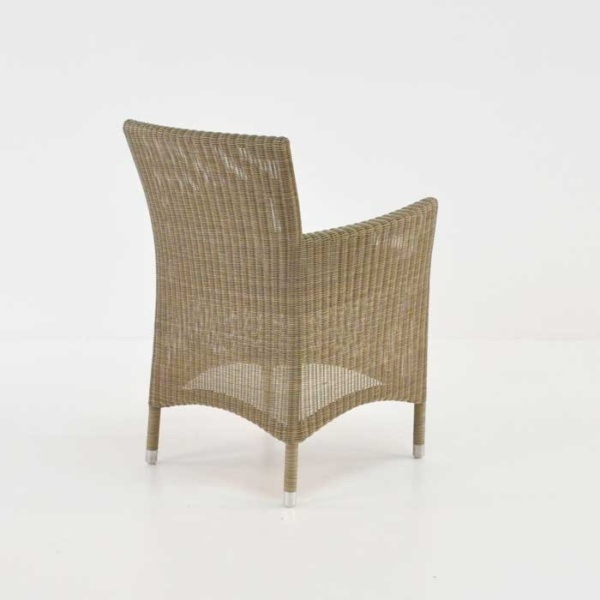 Swanky, contemporary and superior; the Enna Wicker Dining Arm Chair is a fashionable and comfortable choice for your home or garden. What would be a boxy, mod look is offset by a gentle curve around all edges, creating an overall look and feel of luxury. 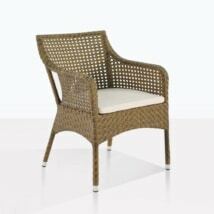 Made with the best materials for outdoors, the Enna Wicker Dining Arm Chair is sure to impress! W24" x D24" x H33"
We begin our construction with a powder coated aluminium frame, which will avoid any nasty corrosion or rusting, and the whole piece is finalized with with Viro® outdoor wicker in divine stonewash in an attractive, fine weave and with a silver/dove Sunbrella® cushion as shown. 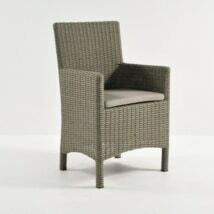 All weather wicker has become an extremely popular product at Teak Warehouse, our customers love how easy it is to look after and the different style options available to them! Viro® is an award winning variety of wicker, treasured for its eco-friendly attitude, resistance to UV rays, strengthened fabric and longevity! 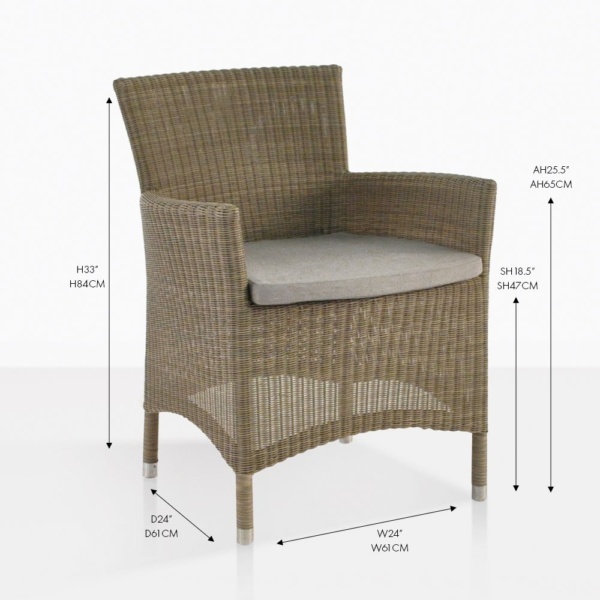 We like plush, luxurious items so we had a free Sunbrella® cushion to every Enna Wicker Dining Arm Chair to keep the comfort and quality levels right up there! At Teak Warehouse, we are proud to offer many options for our stunning, opulent, marine worthy outdoor furniture – as well as stunning Viro® and resplendent Sunbrella® we offer A-Grade Teak, Reclaimed Teak, varieties of mesh, Resin, Raw Concrete and #316 Stainless Steel – so no matter what you’re after – whether it’s seating or lounging, leaning or pieces to accessorize – we are confident you will find something fabulous to suit your space. 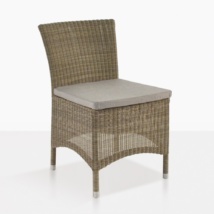 Pair this comfortable wicker arm chair with our reclaimed teak trestle style dining tables or one of our A-Grade Teak extension tables for a fabulous outdoor dining look. By adding a rectangular Cantilever Umbrella in a matching silver color (to your Sunbrella® cushion) you will complete the look and enable you to dine outdoors for longer without being intruded by the harsh suns rays. Have a rooftop area you wish to update and modernize? Try a chunky Raw Concrete Round Table with 4 Enna Wicker Dining Arm Chair for an inherently stylish and sumptuous feel. If you love to entertain but want to keep an en vogue feel to your outdoors, you might be in need of a long table such as one of our Stainless Steel Extension Tables – choose a large version such as 86” to 133”, place an Enna Wicker Dining Arm Chair at either end and its comrade the Enna Side Dining Chair down each side. Keep a couple on standby in another area of your house with a small side table, until you need to extend for those big family dinners. This is a setting that you will cherish! 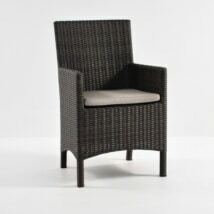 This chic wicker arm chair is a great alternative to a relaxing chair, simply place two side by side on your patio, adding in an Accent Table either in a complementary wicker box style table, or mix up the look with a rustic Side Table in rich Recycled Teak. 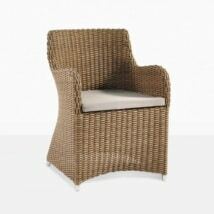 The Enna Wicker Dining Arm Chair is in stock and available now for purchase and delivery. 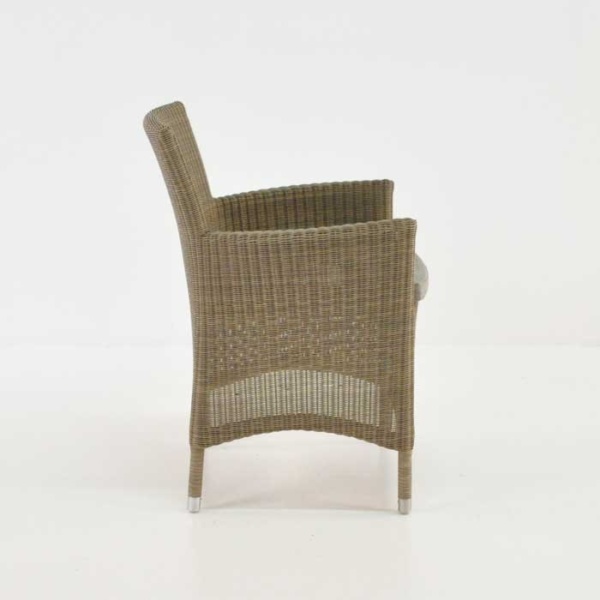 Contact one of our friendly sales team to discover more fabulous combinations this attractive wicker arm chair can be used in!